This French-Belgian comedy was released in France and Belgium in November 2010 and has now made its way to North America. Starring Catherine Deneuve with Fabrice Luchini and Gerard Depardieu, the film tells the somewhat amusing story of a submissive wife, a supposed "trophy wife", who finds her wings by taking over her husband's umbrella factory when he is incapacitated. 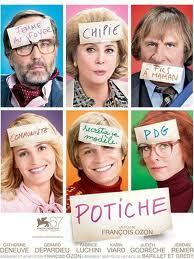 The French word potiche is a decorative vase which also means a person who is pretty but without importance or power. Based on a play written in 1980, the film was made completely in Belgium in 2009 and premiered on September 4, 2010 at the 67th Venice Film Festival. Part comedy with some farce thrown in, the time period of the story being 1977 also reflects the spirit of women's liberation in the business world. It is not without some amusement that we see the connection between the husband becoming incapacitated and his workers going out on strike. Is there anything more French than a strike? I remember being warned before my first visit to France years ago that la France likes to take up the cause of the worker and employees being out walking the picket line was a regular occurrence. My experience is that every cliché is based on fact and yes, France does seem to have more than its fair share of strikes. The producers have managed to recapture 1977 alright with the clothes, the cars, and the general look about the entire film, although at times, I had the impression I was looking at a setting which was older than that. Is it me or at times did this seem more like the late fifties or early sixties? Maybe I'm just confusing this with the office comedies of Doris Day and Rock Hudson. Okay, that dates me. I'm being probably picky if not unfair, but seeing Deneuve and Depardieu together today and thinking back to 1980 when the two of starred together in The Last Metro by François Truffaut, well, there's no comparison. Age is great for a wine but not necessarily so for us humans. I had to look twice to confirm that Deneuve was in fact Deneuve and Depardieu has changed, ah, dramatically. Nevertheless, the two of them work together flawlessly on the screen. Pro is pro and that is clearly in evidence here. It is sometimes a little puzzling watching a film with subtitles. Okay, if you don't speak the language at all, you can skip listening to the dialogue and focus on the text. However, if you do speak the language even a bit, you get distracted. Do you listen to the dialogue or read it? Sometimes you're reading and miss what's being said and sometimes you're listening and miss reading. It can be confusing and you just have to tell yourself to focus on one or the other, but trying to do both can throw you for a loop. Hmmm, would this be a good spot to say "merde"? This is not your profound art film like my other recent review, Certified Copy; this is supposed to be a light hearted comedic romp. Rotten Tomatoes gave it a rating of 83% which is pretty good, but I would have rated it less than that. I classify it as average maybe good however you would do better to wait until it comes out as a rental. If you restrict yourself as to the number of films you pay full pop for at the cinema, I would advise you to shell out for something else to get your money's worth. I saw this not long ago. Thoroughly enjoyed it. I'm not sure what I was expected, but I tend to enjoy Deneuve in most things.